Jesus asked [the official with the sick son], "Will you never believe in me unless you see miraculous signs and wonders?" I have often heard Christians today remark that if they could just have seen Jesus do one of his amazing miracles they would find it easier to trust him fully. There are two problems with this point of view: The first is that Jesus is often doing miracles in our lives and in the lives of those around us every day; we just don't notice them. Second, many who saw Jesus do a miracle kept wanting him to do more or they would not believe. What must Jesus do before you will really believe? I'm not talking about making a decision in your mind that what the Bible says about Jesus is true. I'm talking about faith the way most New Testament writers talk about it; do you trust enough to live your life governed by the truth of Jesus? This kind of trust leads us to lifestyle changes, a shift in our ethics, and radical changes in the way we view people and face the future. 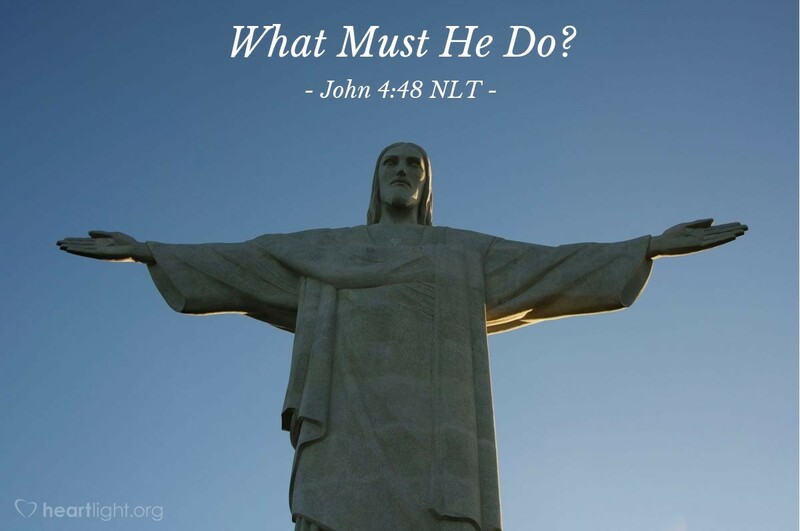 What must Jesus do to help you believe? Hasn't he already done it? Father, forgive me for not letting the faith in my head fully transform my lifestyle. I want to trust Jesus as my Lord in every area of my life. Empower me by the power of your Holy Spirit and convict me as I read your word so that my life directly shows that I believe in Jesus and that my heart belongs to you. In Jesus' name. Amen.